This is the final disc in my last order from Hong Kong. I know this was released in the US and just about everywhere in the English speaking world, but it was cheap, so I thought what the hell and added it to the cart. This CG fest is based on a manga called “2001 Nights” which I think had a US release sometime in the 1990’s from Viz. The OVA is advertised as being from the creators of the “Appleseed” movies and “Vexile”. That didn’t really inspire much confidence in this show. The first OVA, “Elliptical Orbit” is supposedly set in 2068. Humanity has set up a colony on the moon which has three hundred thousand occupants. Supplies are sent to the colony via a large platform orbiting Earth called the Midnight Bazooka, which shoots containers to the moon’s orbit. A ship known as the Flying Dutchman is to dock unexpectedly at the Midnight Bazooka for minor repairs. This makes the captain of the Bazooka, Dan, uneasy. His former lover, Maria, is the captain of that ship. The ship has made a 15 year round trip to Alpha Centauri on a mining mission and is rumoured to have brought back liquid proton mined from a planet orbiting the star, a power source that could provide enough energy for the entire planet for a decade. However due to light seed travel the theory of relativity has kicked in and time dilation has occurred. Dan is many decades older than Maria due to various trips to Alpha Centauri. The reunion is a little tense to say the least. Without warning, the Midnight Bazooka is overrun by terrorists who want to shoot the highly volatile liquid proton from the Bazooka into the moon colony to destroy the colony. Maria and Dan must join forces to thwart their plan. 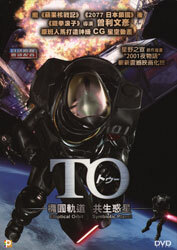 The second OVA, Symbiotic Planet, takes place some one hundred years after the first. Humanity has expanded beyond the solar system and is beginning to colonise and mine other planets beyond. On one particular planet, two country blocs, a Eurasian and a separate American alliance have set up two competing bases on the one planet. Alina, from the Eurasian camp and Ion from the American camp are madly in love with each other but are hamstrung by the cold war-like tensions between the two camps. Both are told to not see each other by their respective superiors. Talks are held between the two parties at the American base and overseen by the UN in attempt to come to some sort of agreement on how to use the resources of the planet. However just before the meeting is to take place, a accident takes place, where spores from an alien fungus escapes a lab and begins to spread, engulfing not only Ion, but the rest of the base. The Eurasian commander decides that this would be a time to the take the opportunity to destroy the American base. However Alina is determined to save Ion. Wow, this is real mixed bag. Like “Vexile” and the “Appleseed” one of the big problems here is the animation itself. It’s cel shaded CG. There are a number of problems, starting with the facial expressions. They just look wrong. Certainly they’re not quite expressive enough. A lot of the moments aren’t really right either. There are a lot scenes which just end awkwardly where the character just seems to be motionless. It’s a bit weird. The second major problem has to do with the science of the show. Take the mechanics of the Midnight Bazooka for example. The physics seem rather bad to me. Wouldn’t the use of the gas mechanism cause the entire structure to move in the opposite direction? It just wouldn’t work as a concept in space. Maria also makes mention the ship’s carburettor needs looking at. Sorry, a carburettor in space? There’s also the problem of who several centuries into the future, humans could no longer be able to securely and safely contain alien biological matter. I mean they have the means to do that in the present. However the main problem of this show is the story itself. The first OVA isn’t too bad, but there’s some weird stuff like one of Maria’s crewmates practically sexuality harassing her to almost the point of sexual assault. The second OVA is worse. Apart from the dreadful “Romeo and Juliet” plot it suffers under the weight of a ton of clichés. There’s also the incredibly drippy ending where, and yes this is a spoiler, the two warring sides differences are miraculously solved by the nature of the fungus. It was so stupid and corny I almost threw something at the TV. So while it had its moments, especially in the first OAV and some of the CG was spectacular, especially the opening animation, this series isn’t much to write home about. 5 out of 10.